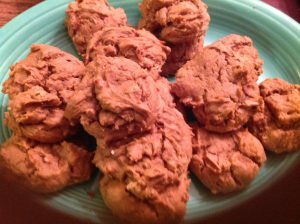 These are great cookies to start the fall season, not too heavy but the right amount of spice to get you ready for the chilly fall weather. They are also incredibly easy to make since they start with a cake mix. 1. Preheat oven to 350. Spray cookie sheets with cooking spray, this is necessary the cookies will tear apart if you don’t. 2. Place half of the cake mix in large bowl, add the pumpkin, egg, oil and spices. Mix with hand-held mixer until smooth. Stir in the remaining cake mix until all dry is incorporated. 3. Drop by teaspoonfuls, 2 inches apart onto cookie sheets. 4.Bake for 10-13 minutes or until set at edges and just barely set in center when lightly touched. Cool for 1 minute on sheets. Transfer to wire racks and cool completely.